We saw Arcade Fire a little while back and popped over to iQ Food Co. for dinner beforehand. Its a perfect spot to grab a healthy dinner before a basketball game or concert. I was inspired by their menu and decided to try making a version of their Glow Box - I call it, Glow Bowl 2.0 (original, I know). *Note: Any lemony dressing or vinaigrette will do; we had this one leftover in the fridge and it was a perfect fit! In a large bowl, combine the chopped cabbage, 1-2 tbsp olive oil and turmeric. Toss to combine and transfer to a parchment lined baking sheet. Roast for 15 minutes. 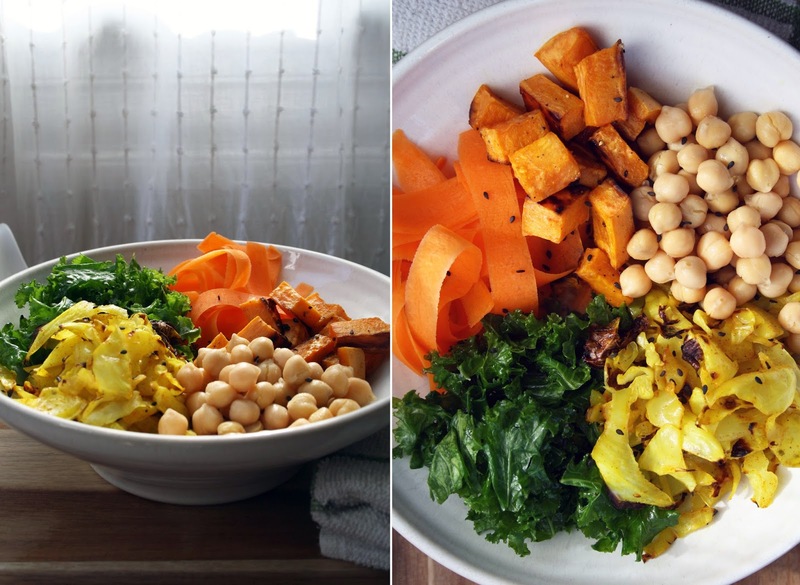 Reusing the same large bowl, toss the sweet potato pieces with 1 tbsp olive oil, salt and pepper. Roast for 30 minutes. While the veggies are roasting, peel your carrot into ribbons and set aside. Toss the kale with olive oil, salt and pepper and massage with your hands to coat evenly. Set aside. When ready to serve, place a heaping scoop of rice at the bottom of the bowl and drizzle with the sunflower lemon sauce. Evenly divide the toppings between the four bowl. Sprinkle with black sesame seeds and more dressing if you'd like.